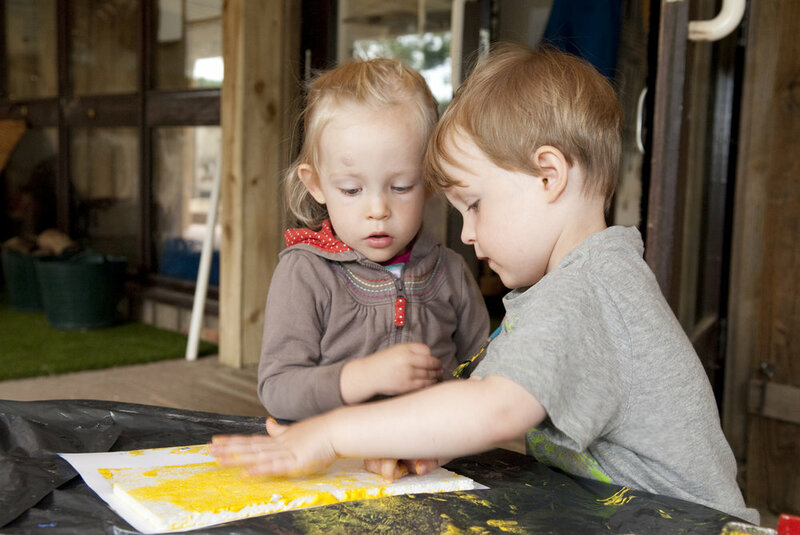 At our outdoor nurseries we believe that building a connection to the natural world is one of the most important things we can do for our young children. Every child is born with a natural affinity to the outdoors; it is often where they are the happiest and the most creative. The foundation of our educational approach is to nurture and develop in young children this love for the environment. Because we believe that this affinity with the natural world will allow them to become protectors of it, now and in the future. In this article we will discuss the many ways that we, together with our children, can do more to protect and care for our planet. We will share the practical ways that we at our outdoor nurseries make a difference through our day to day activities with young children. From environmentally sustainable building features, to recycling and Eco schools; from learning about endangered species to creating habitats for insects and bees. We believe that no matter how big or small, we can make a difference and through this our children will be the advocates for the environment and sustainability. All of our settings were established with a connection to nature in mind. Our outdoor nursery at Avon Heath, near Ringwood, is set in the middle of a 600 hectare area of protected heath and woodland. At Durlston, near Swanage, our nursery is on a coastal nature reserve and UNESCO World Heritage site. Our nursery near Winchester, is a unique site set in the grounds of Marwell Zoo where children see zebras, penguins and giraffes on a daily basis. The Lymington nursery is established on an organic farm with chickens and miniature pigs and at Lytchett Minster, our newest outdoor nursery near Poole, children from 1 year old spend time in the allotment, wildlife pond and fruit orchard. At all of our outdoor nurseries, our children establish a genuine connection with nature. They take part in daily explorer sessions with country park rangers and zoologists; they join Forest School sessions in the woods and take part in daily gardening activities in the garden and allotment. What is most important is that we allow children space and time in nature; to discover; to play and to explore. In the outdoors children have a sense of freedom that allows for true creativity, adventure and friendship. We find that children are often the most inventive when outdoors. Nature is their playground. A child will find a hundred uses for a stick, a hundred ways to build a den and a hundred ways to invent different outdoor games. Many of our parents tell us that even years later, their child still has a great love for the outdoors - that their child is happiest just spending time in the forests, parks and beaches that we are so fortunate to have on our doorstep. Our approach is about establishing a connection to our planet, that does not solely exist outdoors in nature. All of our nurseries have beautiful indoor environments using natural materials such as wood and recycled materials. We aim to connect children to the world at large through story-telling and songs. Our resident artists use natural materials for art activities, such as making natural vegetable dyes and using sticks, leaves and moss for homemade brushes. We collect bottles, boxes and shredded paper for art projects and junk modelling. In the kitchen children help prepare meals with local, seasonal and often homegrown produce and children collect and sell the eggs from our chickens, the proceeds from which go to charities helping those in need. Some of the practical things we can do is to reuse and recycle materials. Some of the most inventive child-led play activities come from objects that would otherwise be discarded. In our outdoor nurseries you will find wooden crates and car tyres for dens, sinks and saucepans for mud kitchens, pipes and guttering for water-play. All sorts of items can be found from your local recycling centre or donated by local businesses, such as plumbers and builders. A recent study has shown that the unstructured element of such materials encouraged more creativity, inventiveness and imagination than other bought play materials. In addition children spent more time playing with them and demonstrated more constructive play, cooperation with others and role-play. At our Lymington nursery the children build an entire greenhouse from recycled plastic bottles! All of the Kids Love Nature kindergartens are working towards Silver Award or Green-Flag status through the Eco-Schools programme. This scheme suggests practical goals to work towards that allow children to take in a lead in living more sustainably, reducing waste and consuming less water and energy. Discussing our use of water and energy, though stories and pictures leads children to think about aspects such as how we can collect rainwater and use natural energy such as wind and solar. Children in our kindergartens become aware of food waste, how we can compost and use the wormery to reduce landfill. Recycling is a part of everyday life. Get children involved and they will become your very own eco warriors! Young children often have a remarkable understanding of the world and our impact on it. Some of their views and observations are so enlightening that they can actually make us stop and think. The responsibility of caring for our planet will eventually fall on the shoulders of today’s children and future generations. We can start today, even with very young children, in our nurseries, schools and homes, by passing on the belief that together we can make a difference. If you would like to see the Kids Love Nature approach in action and all the incredible work our children are doing for environmental sustainability just contact your local nursery in Ringwood, Lymington, Swanage, Marwell Zoo or Lychett Minster for a showaround.